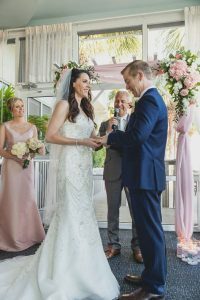 Angie and Josh came all the way from Lake Mills, WI and chose the beautiful Clearwater Beach Marriott Suites on Sand Key on Clearwater Beach, FL as the venue for their destination wedding on a beautiful, but windy afternoon in mid-January. Angie looked gorgeous in her wedding gown as she was escorted down the aisle by Josh’s father to join Josh under their wedding arch. There, the couple shared their custom designed vows, exchanged rings and were pronounced husband and wife by Rev Rick Lackore of Sensational Ceremonies. Ceremony Music was provided by a string duo from Sunset Strings, and Ceremony Audio provided by Craig with Grant Hemond and Associates; and flawless Venue Coordination provided by Jimmy, and the rest of the staff at the Marriott. This picture, provided by Yours Truly Media, captures the moment that Angie shared her ring vows with Josh. Congratulations to the new Mr. and Mrs. Josh Erdman!